Velopark Armenian app gives opportunity for cyclers to find nearest bicycle parking, service and rental points and shops by presenting detailed information- photo, address and coordinates. The app that has been launched recently is available in AppStore and Google Play. It was developed by “Aparg” company that has 5 team members. Arsen Pyuskyulyan and Arshak Alexanyan are the co- founders. Arsen Pyuskyulyan told Itel.am that Velopark will interest all bicycle lovers and those who prefer healthy lifestyle. More than 110 points are presented in the app currently. “Beginners in cycling are considered to be a separate target. They can find places where they will be able to buy their first bicycles with the help of the app or rent from a place more convenient for them. Tourists are also considered to be a target group: they can learn about rental and parking points with the help of the app”, he said. Arsen Pyuskyulyan stressed the application’s social nature. “Cyclers can add point on their own, – a parking place, a shop, etc. We have created a voting system to avoid spam. A certain number of application users should vote for a newly added point for it to appear on the general map,” he said. The co-founder of Velopark highlighted that the application doesn’t focus only on Yerevan. It has data from other regions of Armenia, which will be completed soon. 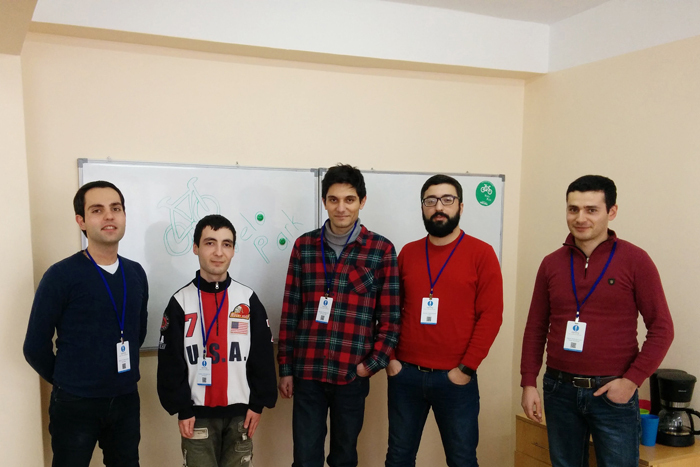 Arsen Pyuskyulyan talked about coming up with the idea of the application: the goal was to make an investment in healthy lifestyle and development of bicycle culture in Armenia. “Considering the fact that the application came out during a season not quite comfortable for cycling, we have an encouraging number of downloads and users. We were also happy to find out that some places of amusement expressed a desire to join the “green movement” by pasting Velopark logos in their establishment,” concluded Arsen Pyuskyulyan.